Social networking was used to draw hundreds onto London’s streets yesterday. Armed and ready to do battle, they descended on Clapham, Brixton and Hackney. Units later broke out in Manchester and Birmingham. Yet these gangs were not armed with hoodies and firebombs; they came with bin bags and brooms. Their goal was not to tear down and destroy, but to cleanse and to heal. At some point during Monday night, a website and twitter feed entitled ‘riotcleanup’ were created. 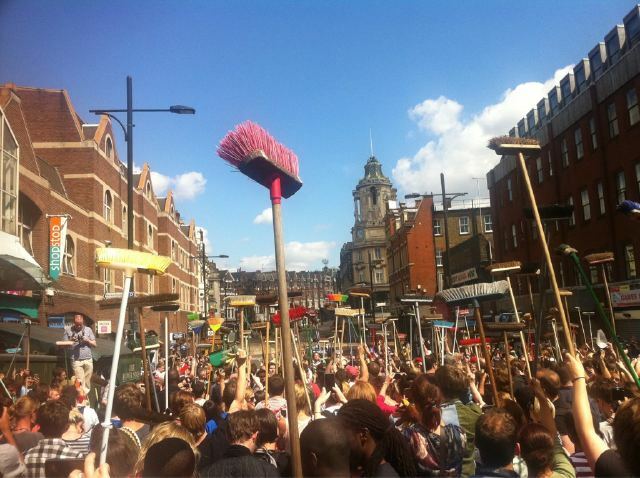 By mid-afternoon @riotcleanup had over 70,000 followers, and 600 people were waiting in Clapham for police to open the roads and allow them to swoop in and sweep up. Even more heartening, though, was the fact that at the top of Twitter’s ‘trending’ list, showing what key words are being most used across the micro-blogging site worldwide, the hashtag #prayforlondon sat at the top of the list for most of the day. That means that every time anyone anywhere in the world logged on to twitter’s home page, the call to pray for the UK’s capital city was in the most prominent position. Christian groups and charities were also taking advantage of the social media networks to circulate suggestions for how to pray and how to give practical help: some sent out appeals for clothes they could give to those whose homes had been burned out; others suggested baking goodies for the hard-working police and fire crews; still others publicised prayer vigils being held across the city. Looking at the scenes on TV and the internet, it would be possible to think that the UK had descended into anarchy. Violence and destruction seemed to rule the streets, yet when dawn broke, good people, who cared about their neighbourhoods, were ready and willing to put their compassion into action. This is the famous sociological ‘Broken Windows Theory’ on a grand scale. Simply put, the theory, posited by George L. Kelling and James Q. Wilson in Atlantic Magazine nearly 30 years ago, states that if a neighbourhood is such that broken windows remain broken and graffiti remains disfiguring the walls, then it will not take long before more windows are broken, more graffiti appears, and vandalism generally increases. If, however, windows are fixed, walls are cleaned up and the area is generally well-tended, it will remain well-tended and will feel both a safer and a more pleasant place to live. Londoners and residents of other cities across the UK could have hidden indoors, battening down the hatches and sheltering from the storm. They could have called on the local councils to clear up the mess. In taking the responsibility and making a stand, though, they have chosen to reclaim their streets and not surrender them to violence and destruction. When the world looks darkest, it is important that we not lose hope, but focus on the good that remains, and allow our light to shine brightly. However you choose to respond, remember to stay safe, and to work with the local authorities to help and not hinder their work. In the 1970’s the Northampton Development Corporation (NDC) was working to rapidly increase the size of the town. This included building large housing estates. Large housing estates could mean trouble, so the NDC thought of ways to reduce the risk. One of them was to erect ‘Graffiti Boards’. They were,secure, free-standing structure that looked as if they were intended as noticeboards. There theory was that if vandals saw these borads without notices they would adorn them with graffiti and, while busy spraying those boards they would not spray anything else. It worked fairly well. A team from NDC’s Environmental Care Unit would regularly clean them so that they could be attacked again. Perhaps the solution to the current situation would be to create ‘riot areas’ (complete with broken windows) that look like real parts of the city but are just fake replicas that can be destroyed and reconstructed at will? Genius! I love it!! Not sure about creating fake riot areas, though, depends how big they are. I think it could be argued that, say, Brixton is already one such area, but people will insist on trying to live in it, run businesses, bring up children etc, and are, not surprisingly, a bit put out when the rioters come to use it for what they see as its intended purpose! I do like the idea of graffiti boards, though. I think you probably know that on the South Bank, beneath the Royal Festival Hall there is an area set aside for youths to graffiti-fy and skateboard in. It works really well, too, they’re contained, but not hidden away, so as far as I can tell they don’t get up to anything criminal, but they have a place to hang ou and do what they enjoy.